A look at the economic effects of a cut in the Central Bank base rate. Lower interest rates make it cheaper to borrow. This tends to encourage spending and investment. This leads to higher aggregate demand (AD) and economic growth. This increase in AD may also cause inflationary pressures. Reduce the incentive to save. Lower interest rates give a smaller return from saving. This lower incentive to save will encourage consumers to spend rather than hold onto money. Cheaper borrowing costs. 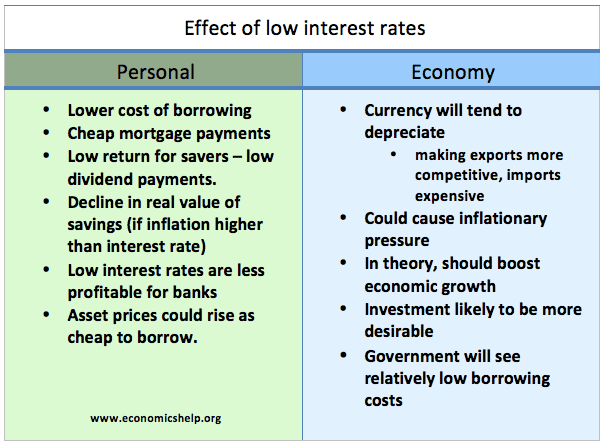 Lower interest rates make the cost of borrowing cheaper. It will encourage consumers and firms to take out loans to finance greater spending and investment. Lower mortgage interest payments. A fall in interest rates will reduce the monthly cost of mortgage repayments. This will leave householders with more disposable income and should cause a rise in consumer spending. Depreciation in the exchange rate. 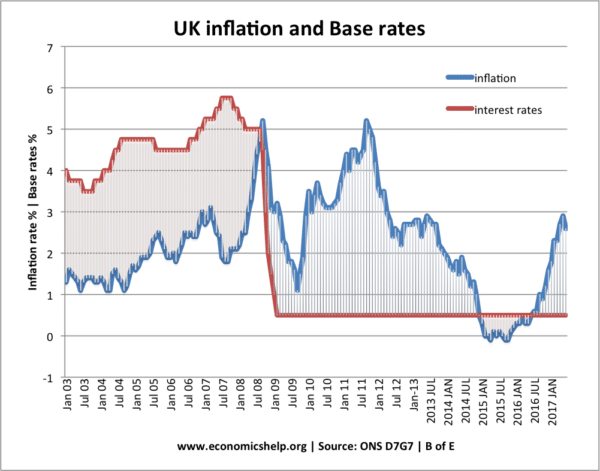 If the UK reduce interest rates, it makes it relatively less attractive to save money in the UK (you would get a better rate of return in another country). Therefore there will be less demand for the Pound Sterling causing a fall in its value. A fall in the exchange rate makes UK exports more competitive and imports more expensive. 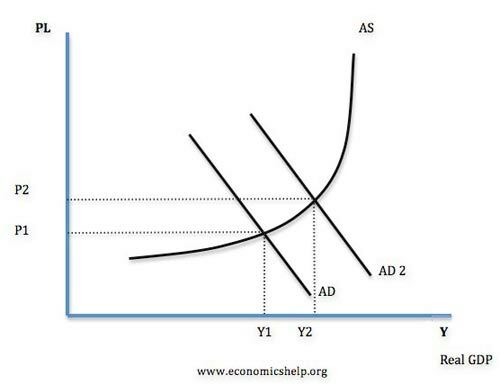 This also helps to increase aggregate demand. 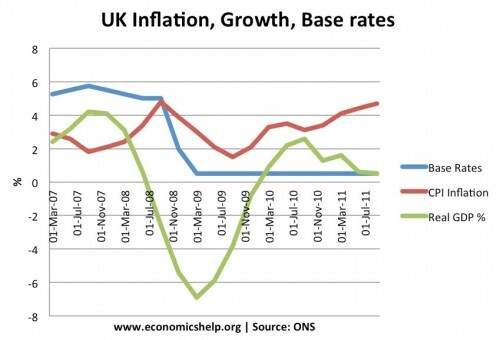 UK interest rates were cut in 2009 to try and increase economic growth after the recession of 2008/09, but the effect was limited by the difficult economic circumstances and after effects of the global credit crunch. If lower interest rates cause a rise in AD, then it will lead to an increase in real GDP (higher rate of economic growth) and an increase in the inflation rate. Evaluation of a cut in interest rates This shows the cut in interest rates in 2009, was only partially successful in causing higher economic growth. This is because many other factors were affecting economic growth apart from interest rates. Will interest rate cut be passed on to consumers? If the Central Bank cut the base rate, banks may not pass this base rate cut onto consumers. For example, in the credit crunch of 2008/09, banks were short of liquidity and keen to encourage more bank deposits. Therefore, when interest rates were cut to 0.5%, banks didn’t reduce their interest rates very much, so the interest rate cut had little effect on consumers. It depends on other factors in the economy. Ceteris paribus, a fall in interest rates should cause higher economic growth. However, there may be other factors that cause the economy to remain depressed. For example, if there is a global recession then export demand will be falling, and this may outweigh the small increase in consumer spending. Bank Lending. Interest rates may be low, but banks may be unwilling to lend. e.g. after credit crunch of 2008, banks reduced the availability of mortgages. Therefore, even if people wanted to borrow at low-interest rates they couldn’t because they needed a high deposit. Consumer Confidence. If interest rates are cut, people may not always want to borrow more. If confidence is low, a cut in interest rates may not encourage more spending. After 2008, we saw an increase in the savings ratio (despite interest rate cut) this was because confidence fell in the great recession. Deflation. If we had deflation then even if interest rates are very low, then people may still prefer to save because the effective real interest rate is still quite high. Time Lag. A cut in interest rates can have up to 18 months to affect the economy. For example, you may have a two year fixed mortgage deal. Therefore, you are not affected by the lower interest rate until the end of your two-year fixed mortgage term. A cut in interest rates will have a different impact on different groups within society. Lower interest rates are good news for borrowers, homeowners (mortgage holders). This group may spend more. Lower interest rates are bad news for savers. For example, retired people may live on their savings. If interest rates fall, they have lower disposable income and so will probably spend less. If a country has a high proportion of savers then lower interest rates will actually reduce the income of many people. In the UK, we tend to be a nation of borrowers and have high levels of mortgage debt. Therefore cuts in interest rates have a bigger impact in the UK, than EU countries with a higher proportion of people who rent rather than buy. On the one hand, lower interest rates encourage consumer spending; therefore there will be a rise in spending on imports. This will cause a deterioration in the current account. However, lower interest rates should cause a depreciation in the exchange rate. This makes exports more competitive, and if demand is relatively elastic, the impact of a lower exchange rate should cause an improvement in the current account. Therefore, it is not certain how the current account will be affected. Will cut in interest rates to 0.25% work in Brexit Britain? Who benefits and who loses from a period of low-interest rates? This entry was posted in A-Level, interest-rates and tagged interest rates. Bookmark the permalink. I need to say thanks a whole lot for your job you have made in writing this posting. I am hoping the same most reliable job from you down the road too. A fall in interest rates will reduce the monthly cost of mortgage repayments. This will leave householders with more disposable income and should cause a rise in consumer spending. Yes it does, it says in the first section that lower interest rates will increase disposable income. Low interest rate means low infaltion in the system means lower income growth as wages will not go up. If the real wages donot go up then affordability will not increase with lower interest rates and hence the asset prices can go up to a level only ( not considering speculatiion) . This post was brilliant! I’ve been trying to get my head around this for a while now, and I’ve finally started to understand. Why do low interest rates make imports expensive? Why do low interest rates makes imports expensive.? what will lower interest rates do to imports?